And We Have a Winner…Susan Koehs! Good Food, Friends, Company and Prizes! 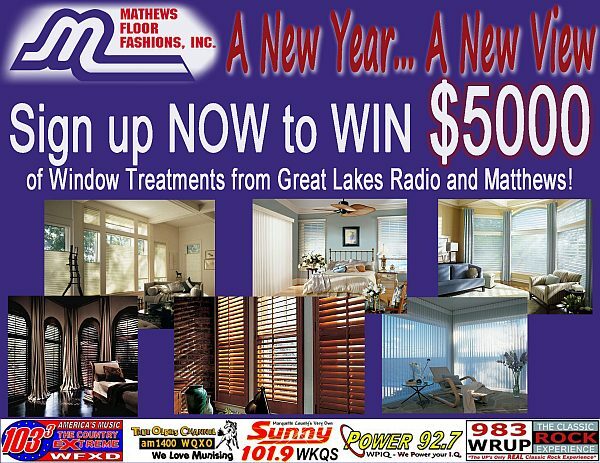 Great Lakes Radio and Mathews Floor Fashions Gave Away $5,000 worth of Hunter Douglas Window Treatments! Susan Koehs of Marquette is our Grand Prize Winner! Ishpeming, Michigan — I don’t think I’ll ever get tired of Mama Russo’s delicious Lasagna, Salads, and Sausage! It was a great time had by all at the New Year New View Giveaway Party with Mathews Floor Fashions and Great Lakes Radio! From the fun games of Bingo, to all the awesome prizes given away–you couldn’t find one person that DID NOT have a smile on their face. We celebrated the big Giveaway Party at the Country Lanes and Entertainment Center in the Country Village in Ishpeming on Thursday night. Most of the staff at Great Lakes Radio made it out! We also can’t thank Joe Burdick and the gang at Mathews Floor Fashions for the $5,000 of Hunter Douglas Window Treatments! 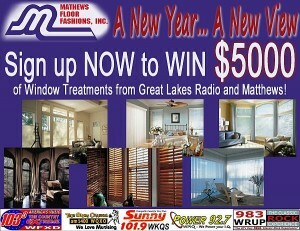 The Giveaway wouldn’t have been possible without Mathews Floor Fashions. Dawn Johnson and Dennis Harold of Great Lakes Radio did a fantastic job calling out Bingo! Can’t thank Dennis enough for his quirky sense of humor during Bingo. Way to go, guys! You kept the crowd entertained and happy! There was also plenty of Autographed Elmer Aho license plates that were on sale during the Giveaway. Many folks couldn’t wait to get their hands on the legends’ personalized license plates! ….OH YEAH….and a BIG CONGRATULATIONS TO OUR GRAND PRIZE WINNER, SUSAN KOEHS OF MARQUETTE!